TORONTO, April 26, 2018 – On Saturday, May 12, close to seventy Royal LePage offices and other community locations across Canada will be transformed into a destination for bargain hunters with the return of the National Garage Sale for Shelter in support of the Royal LePage Shelter Foundation – an organization committed to supporting women’s shelters and ending domestic violence in Canada. Now in its tenth year, this Mother’s Day weekend event brings community members together with Royal LePage REALTORS® to raise funds and awareness to help break the cycle of domestic violence. Since 2009, the National Garage Sale for Shelter has raised close to $3 million in support of women’s shelters across the country. The Royal LePage Shelter Foundation also funds educational programs aimed at helping teenagers develop healthy relationships which should reduce the incidence of domestic violence in future. Royal LePage covers the foundation’s administrative costs and sponsors underwrite event expenses, so 100 percent of the proceeds go to local women’s shelters that provide a lifeline to thousands of women and children fleeing domestic violence. Community members are encouraged to participate and help de-clutter for the cause. 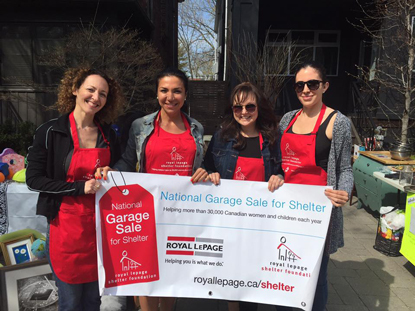 Donate gently used items to your local participating Royal LePage office and stop by the National Garage Sale for Shelter in your neighbourhood on Saturday, May 12 to find some great treasures and help support a worthy cause. Can’t attend but still want to make a donation? Click here to make an online donation. Marking its 20th anniversary this year, the Royal LePage Shelter Foundation supports 200 women’s shelters and other domestic violence support programs across the country, helping more than 50,000 women and children every year. It’s also committed to funding violence prevention and education programs through its partnership with the Canadian Women’s Foundation and Women’s Shelters Canada. Since its inception, the Royal LePage Shelter Foundation has raised more than $27 million with the support of Royal LePage agents, brokers and staff, along with members of the communities in which they live and work. The National Garage Sale for Shelter is made possible with the support of its national sponsors: TD Canada Trust, Mobile Mortgage Specialists (National Presenting Sponsor), Atlas Van Lines Canada (In-kind Moving and Transportation Sponsor), Genworth Canada (Supporting Sponsor) and Kaiser Lachance Communications (Media Relations Sponsor). For more information on the National Garage Sale for Shelter, how you can participate and to find a Garage Sale location in your community, please visit garagesaleforshelter.ca.